American sports fans do not have a wealth of options at their disposal when it comes to US based sportsbook betting. There are only a select few destinations in the United States where sports wagering is legally offered, and there are zero state based opportunities for online sports betting in the US. Even those states that have successfully legalized online casino and poker gambling in their territories have been unable to bypass federal laws which prohibit online sports betting operations from being established here in the states. In essence, any hope for online sportsbooks regulated at the federal or state level in the United States is off the table as a possibility at this time, and it does not look like that will be changing anytime soon. There are alternatives for sports bettors in the US who desire to participate in legal Internet sports wagering. This guide will provide you with information on identifying and locating these options, explaining what they have to offer, and provide specifics concerning the legality of participating in online sports betting as an American citizen. We caution you to remember that bypassing the legal options available to us can put you at risk for becoming a victim to cyber crimes, and potentially breaking the law by participating in illegal gambling operations. Limiting your sports betting to only those brands that have been licensed to provide their services to US bettors is the only safe strategy for enjoying secure, responsible and high quality gambling on sports. How Do I Access Legal Sports Betting Sites that Welcome USA Residents? The best way to reach legal online sportsbooks that are licensed to provide betting options to USA bettors is to rely on the input of industry professionals, such as the creators of this guide and others like it. As we mentioned before, there are questionable sports books circulating on the Internet that may accept bettors from the US, but that are not necessarily legally sanctioned by any regulatory oversight or governing jurisdiction. These sites are simply dangerous. They are difficult to spot because these scoundrels design their site to appear highly professional and mimic the legitimate options. Our team of highly trained professionals is experienced in vetting and authenticating online gambling sites, including sportsbooks. We place each potential sports wagering brand through a very thorough review process to reveal the inner workings, performance and offerings of their operation. We go more in-depth into our process further down on this page to help you understand where we come up with our refined list of recommended US online sports betting sites. Following is a brief look at our preferred USA online sportsbook brand, as well as a list of all of the sports betting sites we recommend to US bettors. Each brand has been personally reviewed by multiple members of our team, from both a sports bettor and industry professional perspective. They are each licensed by respected jurisdictions and offer a very high quality betting experience. We should also mention that these are brands at which the members of our team remain registered players at. We do not recommend any gambling sites that we ourselves are not willing to spend our own money at. Bovada Sportsbook is our premiere US friendly online sports betting site and is licensed by the Kahnawake Gaming Commission in Canada. They cater to US bettors exclusively, and were launched in late 2011 to take over Bodog's previous USA traffic as they exited the US gambling market. They offer a great selection of betting lines and wagering options, and their paylines are right on par with industry standards. They provide new customers with a 50% match bonus up to $250, and deliver a high quality mobile sportsbook option as well. 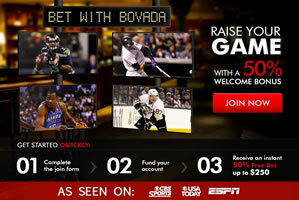 Bovada also offers access to a full service casino, poker room and racebook in addition to their sports betting offerings, all from one player account. There are several federal laws in the United States that affect sports betting opportunities for US bettors. First we have the PASPA that was passed in 1992 which effectively bans sports betting in all US locations aside from a few select destinations such as Las Vegas and Delaware. Secondly, we have the Federal Wire Act that prohibits sports betting through US based electronic options such as the Internet or telephone according to the interpretation issued by the DOJ. Both gambling laws are considered arguable and outdated by many, and they have been challenged by proponents of US based sports betting, however unsuccessfully thus far. These two laws make it illegal to establish sports betting services in the United States. What these federal laws do not influence is access to legally licensed sports wagering opportunities that are regulated and located overseas and are legally sanctioned by jurisdictions which have already established the legalization of sports betting within their regions. This allows those sites located in these jurisdictions to offer their sports betting services to bettors around the world, including those in the USA. There are no federal laws prohibiting American bettors from participating in legal online sports betting activity at those sites which are operating legitimately within the industry outside of the United States. The key to keeping this above board is to never ever compromise on your due diligence in only accessing licensed and regulated sports book destinations. Should you accidentally or intentionally visit and participate at an Internet sports wagering site that is operating illegally, then you too are breaking the law. Visiting the recommended sports betting sites included in this guide will ensure that you avoid that type of situation completely. Will Legal Online Sports Betting Be Offered By US Based Sportsbooks In The Future? While anything is possible, we do not believe that the United States government will bend on this issue anytime soon. Very recently New Jersey made a valiant attempt to obtain the right to offer sports betting to their residents and visitors. Their efforts were blocked through a lawsuit initiated by the NFL, NBA, MLB and NCAA who are strongly opposed to US sports betting, citing the PASPA law from 1992 as their basis for blocking the move. The state appealed to the Supreme Court, who refused to hear their arguments, thereby supporting the decision of a lower court to ban the state from offering sports betting services. The level of powerful opposition coupled with the courts of the land standing firmly behind existing federal laws governing sports betting is a lot to overcome. Before any state has any hope of achieving what New Jersey attempted, the laws of the land will have to be changed. The first thing we do is verify their legitimacy within the industry which means making sure they are legally licensed, compliance certified, and subject to regular auditing of their fair gaming practices. We confirm that they are regulated by a respected governing jurisdiction that has stringent licensing requirements and industry standards that exceed minimum expectations incorporated into their regulation procedures and policies. Once we determine that they are legitimate, we then evaluate the quality of their services, customer support and banking suite. We perform industry analysis and comparison to ensure that their betting and pay lines are comparable with those of competing online and offline sportsbooks and Vegas standards. By taking our professional input into consideration when making your sports betting site selections, you are eliminating the risk of becoming vulnerable to unethical, predatory and dangerous online sports betting situations, making it your best solution for reaching a sports wagering destination that is licensed, safe, and dedicated to customer satisfaction. We have made recommendations for you based on our analysis and reviews of the US friendly online sports betting sites available on the Web. You will find them listed on this page. © Legal Gambling Sites - All Rights Reserved.